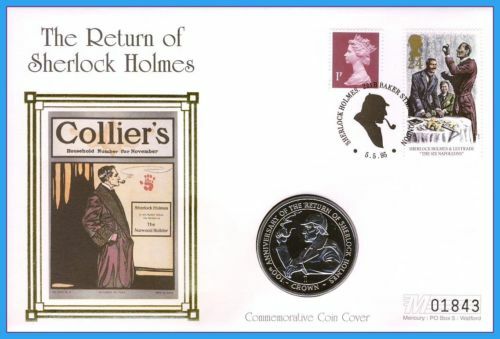 In October 1993, the United Kingdom issued five different 24 pence stamps featuring Sherlock Holmes themes. 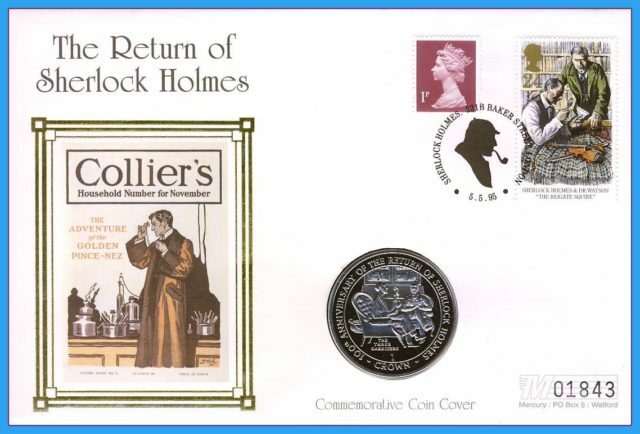 In May 1995, a set of five different Philatelic – Numismatic Combination Covers (envelope with postal cancellation and a numismatic item, usually a coin) or PNC for short was developed for the British Isles Postal Covers Collection. 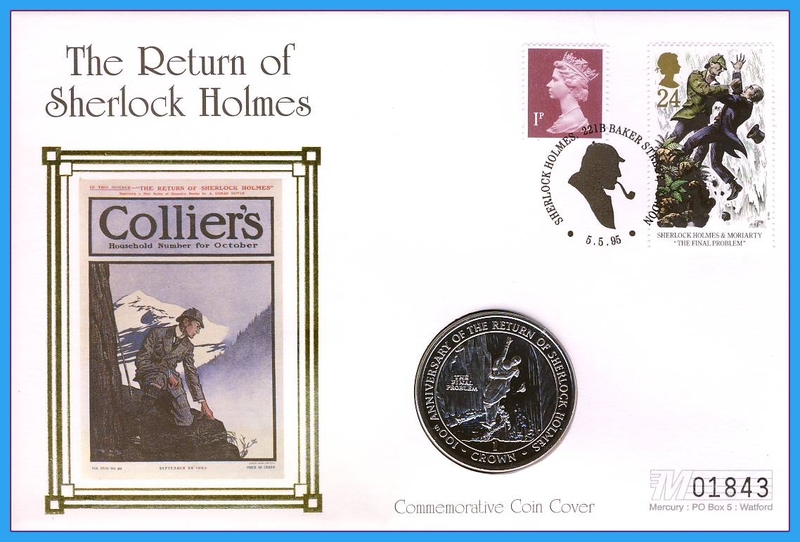 These five covers featured one of the stamps above, one of the 1994 Gibraltar cupronickel 1 Crown coin, and the envelope would feature one of the front page illustrations of Collier’s that was illustrated by Frederic Dorr Steele. Each of these PNCs came with the same generic presentation page that allowed storage in a four-ring binder. There is no rhyme or reason to some of the combinations for the PNC covers, as you will soon see. We will list the PNC covers in the order of how the stamps appear above. For this particular PNC Cover, the stamp has a Reigate Squires theme, the coin from Gibraltar features The Three Garridebs, and the design on the cover is the Collier’s magazine cover for The Golden Pince-Nez. Our next PNC Cover, the stamp is for the Hound of the Baskerville, as is the Gibraltar crown coin. The cover design from Colliers is for Black Peter. 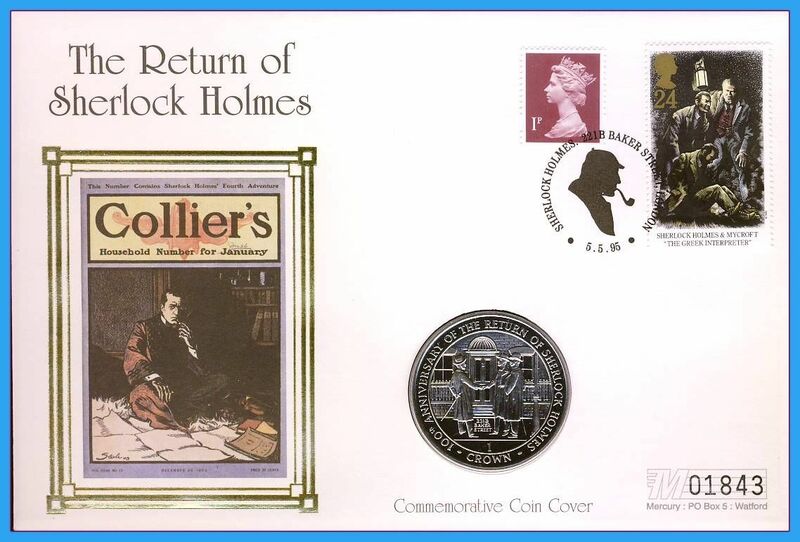 The third PNC Cover features The Six Napoleons as the stamp, the Sherlock Holmes profile 1 Crown coin from Gibraltar and the Collier’s cover for The Norwood Builder. 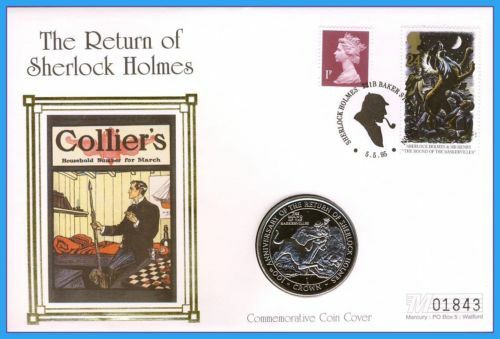 The fourth PNC Cover features a stamp from The Greek Interpreter, the Gibraltar 1 crown coin with Holmes and Watson outside 221b Baker Street. The Collier’s cover was the issue that featured The Solitary Cyclist. The fifth and final PNC Cover comes close to having a theme. 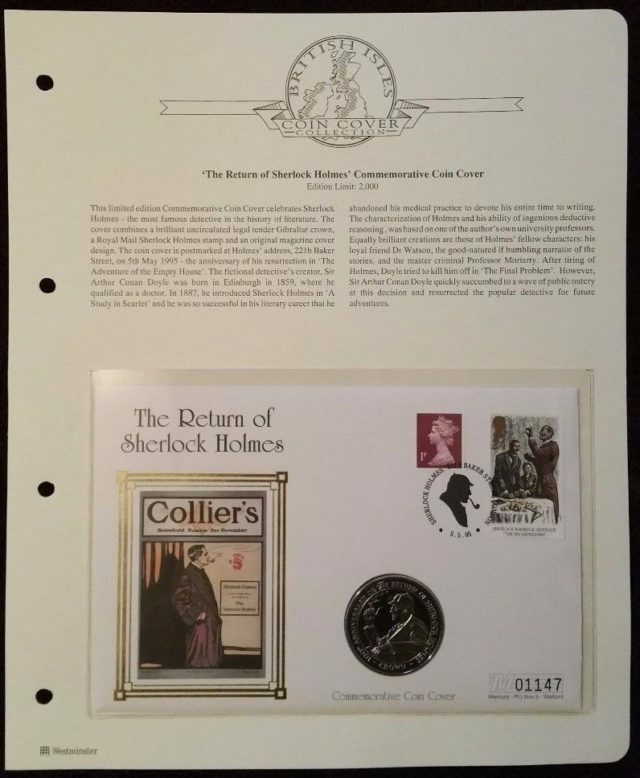 Both the stamp and the Gibraltar 1 Crown coin scene is from The Final Problem. The Collier’s cover is the issue with The Empty House. Each different PNC was limited to 2,000 consecutively-numbered envelopes. If anyone can come up with a pattern as to how they came up with these combinations, please share in the comments below!